Swelling of the flexor tendons: This is probably the most common cause of carpal tunnel symptoms and is usually due to overuse of the hands associated with highly repetitive tasks like line work, computer typing, sewing, knitting, or playing a musical instrument. When fast, repetitive gripping is required, especially if firm gripping is needed and/or the environment is cold, symptoms can occur more quickly. There is a sheath that wraps around the tendons traveling through the tunnel that is lubricated by synovial fluid. This normally keeps the tendon sliding freely inside its sheath. In the CTS patient, the tendon and/or the sheath tightens and creates swelling as extra synovial fluid is produced in an attempt to remedy the excess friction. This increases the pressure inside the sheath and causes more swelling and pain, and eventually conditions such as tendonitis and/or tenosynovitis. If left untreated, this can result in “trigger finger” (stenosing tenosynovitis) that can be more resistant to treatment. This enlarged, swollen tendon-sheath complex places pressure upon the median nerve and results in the classic symptoms of CTS. Misalignment of carpal bones: If one or more of the eight carpal bones become misaligned, it can cause the transverse carpal ligament (the floor of the tunnel) to tighten, narrowing the carpal tunnel and compressing it contents—including the median nerve! Direct compression of the tunnel: ANY occupation that requires the use of hand tools or any other objects that apply pressure directly to the carpal tunnel can cause CTS. Examples include hammers, screwdrivers, drills, pliers, jackhammers, a computer mouse, and more. Vibration: Any job or tool that requires firm gripping and vibration such as jackhammers, chain saws, hand buffers, or grinders can irritate the contents inside the carpal tunnel. Cold Temperatures: Cold vasoconstricts blood vessels and decreases blood flow to the area. When the cold exposure is prolonged, the lack of blood flow can keep needed oxygen from reaching the tissues that need it, possibly causing injury or contributing to an existing injury. Meatpacking or poultry plants are good examples of jobs requiring highly repetitive work in a cold environment. 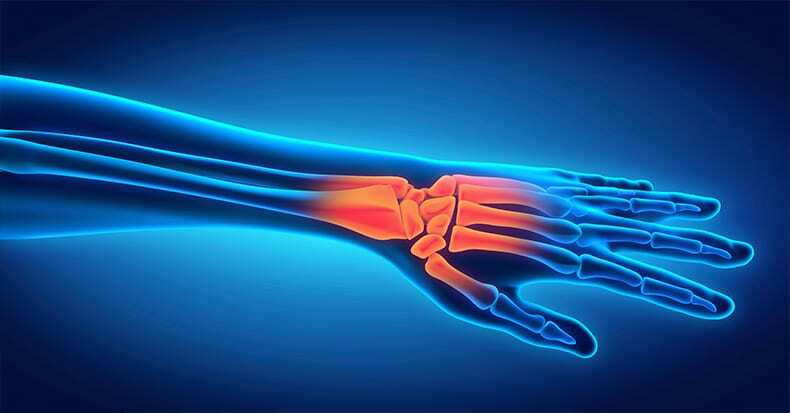 Arthritis: Old injuries (such as wrist fractures) or jobs that wear down the hyaline cartilage (the smooth covering on joints) over time can result in spurs that can compress the nerve. Inflammatory arthritis, like rheumatoid, can also add pressure to the tunnel resulting in CTS. Multiple crush: More than one compression location on the median nerve can worsen CTS. This added compression can occur at the forearm, elbow, shoulder, and/or neck.